The French novelist Honoré de Balzac was the first writer to use fiction to convey the social scene prevailing at a particular period in one country's history. Honoré de Balzac was born in Tours, France, on May 20, 1799, the eldest son of four children of Bernard François and Anne Charlotte Balzac. His mother was thirty-two years younger than his father, and the young Honoré was taken into another home and cared for until the age of four. His mother saw the birth of her son as her duty and treated him indifferently. Her lack of affection overshadowed his childhood. Sent to boarding school at the age of eight, Honoré sought a place to escape from the fierce school discipline. He found this place in books. But excessive reading eventually brought on a nervous condition, which affected his health, and he was brought home in 1813. The following year his family moved to Paris, France, where he completed his secondary education in law. Rebelling against his parents, Balzac refused to enter the legal profession and instead declared writing as his profession. Despite disappointment, his father provided a small allowance with the understanding that he had to be financially independent within two years. Working together with friends, Balzac wrote several sensational (superficial, appealing to the senses) novels, none signed with his own name. These books were without literary merit, but he earned his living by them. Searching for ways to make his fortune more rapidly, Balzac next entered a series of business ventures using borrowed funds. These commercial ventures were also failures, leaving him with very large debts. Thereafter he published the first novel that he signed with his own name. Le Dernier Chouan was a historical novel. Since historical novels were the fashion, the book was well received. But real fame came to him two years later, when he published La Peau de chagrin, a fantasy that acts as an allegory (a symbolic representation) of the conflict between the will to enjoy and the will to survive. The constant struggle to earn enough to keep his creditors at bay drove him to a timetable of work that eventually ruined his health. He increased his hours from ten to fourteen or even eighteen a day, keeping himself awake with frequent cups of strong coffee. Whenever Balzac took a break from his writing, he would frequent fashionable salons (stylish lounges), where he was well received by female readers. Balzac's lifework consists of a series of some ninety novels and short stories collected under the title La Comédie humaine ( The Human Comedy ) in 1841. The Human Comedy was subdivided into smaller groups of novels: "Scenes of Private Life," "Scenes of Political Life," "Scenes of Parisian," "Provincial," and "Country Life." There was a separate group of "Philosophical Studies." The novels were linked by both history and character. This practice enhanced the realistic illusion and also permitted Balzac to develop the psychology (involving the mind) of individual characters more fully than would have been feasible within the limits of a single novel. In a preface to his work in 1842, he defined his function as that of "secretary of French society." Accordingly, every class of people, from aristocrat to peasant, has a place in The Human Comedy. principles that ruled humanity. The monomaniac—the man obsessed by a purpose or passion, to the point of sacrificing his own comfort and the welfare of his dependents—is constantly encountered in Balzac's more impressive novels. Balzac was writing in an age when the struggle for existence or social advancement among the poor was at its fiercest. Balzac himself disliked the disorderly individualism that he observed around him. Human nature, in his view, was basically depraved (morally wrong; evil); any machinery—legal, political, or religious—whereby the wickedness of men could be stopped, ought to be repaired and strengthened. During his last years Balzac suffered from poor health, and his morale had been weakened by the disappointments he endured in his one great love affair. In 1832 he had received his first letter from Madame Hanska, the wife of a Polish nobleman. Thereafter they kept up a correspondence, interrupted by occasional vacations spent together in different parts of Europe. In 1841 her husband died, but Madame Hanska obstinately refused to marry Balzac. Only when he fell gravely ill did she agree. The wedding took place at her home on March 14, 1850. The long journey back to France took a serious toll on Balzac's health, and he died on August 18, 1850. Keim, Albert, and Louis Lumet. 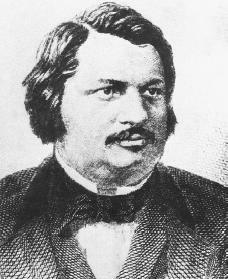 Honoré de Balzac. New York: Haskell House, 1974. Robb, Graham. Balzac: A Life. New York: Norton, 1994.